From the hood to the tundra: Check yo'self, son. 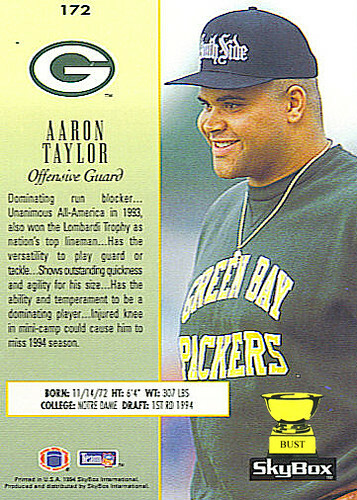 Aaron Taylor is a beast from da block. He been choppin' it up since he was knee-high to a butta'fly, and you know 'dis. This mo'fo ran with the South Side Gangstarz with his killa-cutteez, Ice Bone aka Sweet Toof and Lil' WetJesus. 2Story was the muscle for the South Side Gangstarz, and 'dis baby-faced brotha never hesitated to jack your chain or put some punk from 'round da way 6 feet deep. 'Den some suit with pretty teeth saw him in da hood and offered him a job north side, with Da Green Bay (Thumb) Packers, son. 2Story figured he could chop game with some straight green chronic in Da Green Bay, so he 'cepted the job and left the gat under the pilla at him momma's hout. He went up to Da Green Bay, brought some sticky-icky, and showed 'dem NFL playas what South Side be about, son.